A little help from the owner makes a satisfied customer. First of all, I called the Ceilume company one evening after hours and happened to get the president of the company on the phone. Such luck. 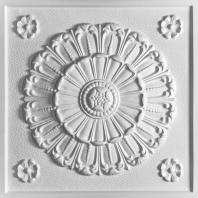 I wanted a tile in the color sand, that was, according to the website, available only in white. He was so helpful, answering all of my questions and actually guided me toward a tile that was more border-appropriate than the one I'd chosen. He sent some pics to me of rooms that featured the tile I wanted. Thanks to Ed Davis! As for the product, I can't say enough good things about the Ceilume tiles. I ordered both white and sand samples. I didn't love the white. Packaging was excellent. Shipment reasonable because they're lightweight. My husband was initially a skeptic about the tiles, relenting only because I told him I could install them without his help. He deemed them "flimsy" tiles, but conceded that the project was a success after completion. Unless you're in-the-know you can't tell that they aren't heavy tiles. I painted my existing ceiling grid with paint mixed to match the tiles, applying with a sponge paintbrush, and then did the entire installation (very simple) by myself in just about 3 hours. (using pre-existing grid) Where the cut, notched portion of the Electra border tiles meet the wall, just above the ceiling grid, there were unfinished spaces . My son came up with a plan for those unfinished spaces. I cut small pieces out of border-tile scraps and laid them between the tile and the wall where the notches are, hiding the wall. It was easy and gives the uniform appearance I was looking for. Also, I loved the Medallion tiles but thought that they were too busy for a 13x13 room so I opted to use them as an accent instead. I even used, as a wall hanging, the Florentine tile that I'd ordered as a sample. I painted it, cut the edge off, and hung it using some braided leather. It looks like those expensive wall hangings that you'd see in a Ballard Designs catalog. Needless to say, I'm a satisfied Ceilume customer.